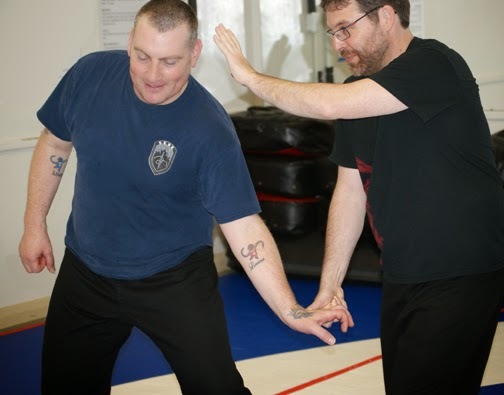 hihan Ron Forrester’s Canadian Jiu Jitsu has always been popular with law enforcement officers. Part of the reason lies in the way the system deals with conflict escalation. It offers plenty of techniques to fill the gap between a minor verbal confrontation such as “I’m not leaving here until I have another drink!” to the extreme other end of the spectrum…the use of lethal force. Each technique can be fine-tuned and applied to the level of force required. The goal is to prevent further harm – both to the officer and to the suspect. One such technique is the come along. 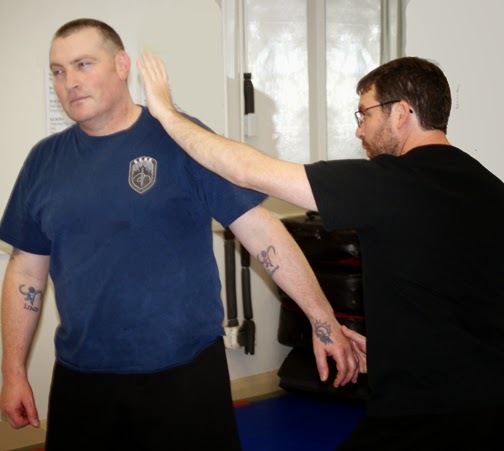 As the term implies, the officer establishes immediate control over a suspect – through minimum pain. Control, de-escalate and move the bad guy to where he’s no longer a risk. Speech, though, come first. Well trained officers normally try to calm the situation by starting a dialogue. “Sir, I’m on your side. Why don’t we just try to sort this thing out? We can do that at the station.” Civil, even friendly, but firm. Again, whenever the verbal come along meets with resistance…there’s always the physical come along. 1. Like any skill, a careful step by step approach is the first order of business. The training partner stands still and remains compliant during the entire time of practise. The goal: solidifying the biomechanics of the technique. Distance, timing, correct positioning, etc, are developed into a unified whole. As skill develops, speed is ratcheted up. Until it approaches the level of conflict. 2. Semi-free style. Various situations are practised. The come alongs are put to the test. A partner might choke you from the rear. You may strike him in the groin, turn and then apply the come along. He might attack you with a knife from the side. You block, strike him, take the knife away and apply a come along. Come alongs aren’t limited just to Jiu Jitsu. Most martial arts include come alongs in their repertoire. So Karate, Kajukenpo, Aikdo, Hapkido can all stop before a simple hurt morphs into a lethal conclusion. 1. Face your partner. Step to the his or her left side, grasping one or two fingers with your right hand while stunning him with a short slap to the left side of his face, temple, ear, brachial plexus, carotid artery, etc. It’s important to move his head away from you. 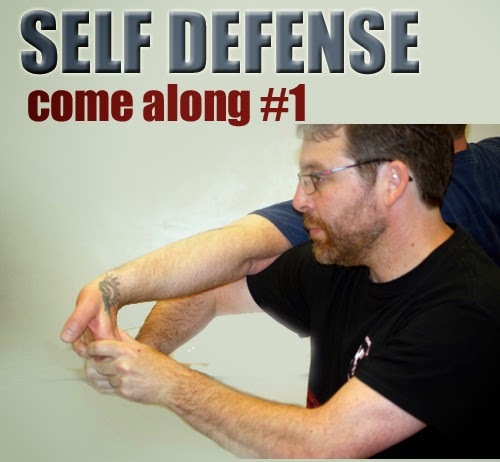 This helps to prevent him from striking you with his right hand while you gain control. 2. 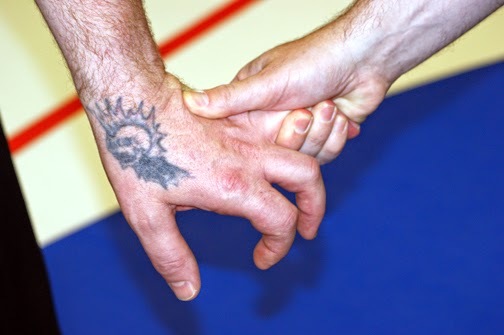 Push down into the back of the hand fast. This creates instant pain. For instant control, first push down fast. Dan feels this right away. Here's a close up of that first movement. 3. Turn to face into the same direction your partner is facing. At the same time, grasp his fingers with your other hand as well and twist the hand around so that the palm faces upward. Nudge your bent right arm under his arm, pushing his elbow up. The boys are starting to have some real fun with this. 4. 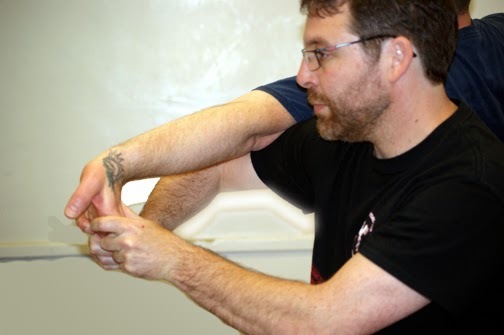 Level his or her arm out so that the arm is as parallel to the floor as possible. 5. Pulling back on his fingers, move him into the direction you want him to go. Of course, many variations of this technique exist. A simple variation, is to grasp his index finger and middle finger with one hand and his right finger and little finger with the other hand. Pull each side apart – while still pulling all the fingers back toward you. Very painful. Come alongs may not work on some people. Some antagonists may have a very high pain threshold; others might be in the midst of a psychotic episode, well beyond pain; drugs and alcohol may numb the pain. And then there are the ultra-relaxed. 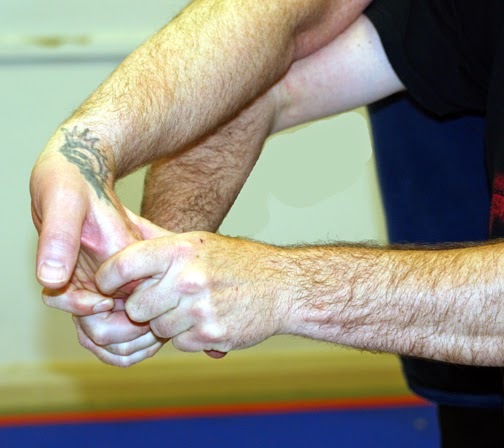 A grip like this may make no difference whatsoever if you work in security at a night club visited by Tai Chi practitioners or the occasional Ninja. That’s when a Plan B comes in handy. I’d like to thank Sensei/Sifu Greg Magwood and Dan Kennedy for posing for these photos. Magwood, by the way, is an amazing instructor. 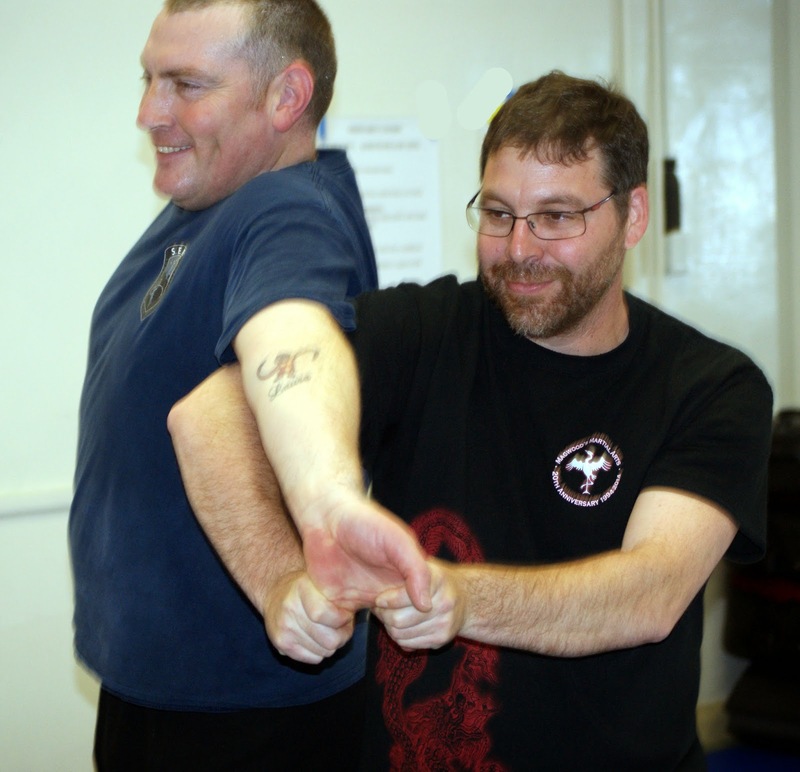 He’s the complete instructor – kind and caring, lots of skill and knowledge, and deeply interested in exploring all aspects of the martial arts. I highly recommend his classes. Plus he loves to travel, so if you’re interested in seminars on Karate, Jiu Jitsu, Tai Chi, Hsing I Kung Fu, My Jong Law Horn Kung Fu, I Chuan and Chi Kung, visit his website at MAGWOOD MARTIAL ARTS and touch base with him.